I firmly believe every act should give away an MP3 now and then. But I’m not sure I’d go as far as to suggest that every act imitate Podington Bear, who has promised the world at large a brand new, completely free recording every single Monday, Wednesday and Friday of 2007 – and who, as of late April, appears to be well on target for those 150 free tracks. Is Podington Bear’s task made easier by the fact that he is a solo artist making electronic music, and therefore unencumbered by the need to corral band-mates, worry about vocal quality, and can, on occasion, eschew melody too? Well, yes, but as any electronic musician will tell you, recording such instrumental music is not necessarily easy. Just because you don’t have to rhyme the moon with June, nor worry about the drummer slowing down and speeding up in the middle of the song, doesn’t mean there’s not a comparative universe full of problems to deal with. Indeed, the less you put on a recording, the more you have to put into it. Podington Bear: You didn’t expect a real person, did you? 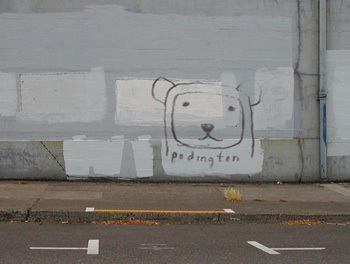 So who is Podington Bear and why is he working so hard to give us so much for nothing? Of the first question, his myspace page declares roots in Portland, Oregon, while his web site gives little away except a link to a short interview in Wired; this is anonymity to the extreme. Of the second, one might believe he announced the project as a publicity stunt, a means by which to be heard making quiet music in a noisy world full of way too many mediocre myspace pages. If so, the concept appears to be working: Podington Bear has already gotten masses of press (and presumably thousands of subscribers), while still not yet a third of the way through his year’s worth of (stockpiled?) material. But if he’s intent on turning the attention to financial gain, he’s yet to make that move. Podington Bear’s music is available by thrice-weekly Podcast, as downloadable MP3s, as a stand-alone radio player via his web page, and even as a Mac Dashboard Widget. In addition, he writes on his site, “I make my music free for any synchronization with any non-commercial video on the internet, and for works in film festivals, via a Creative Commons License.” This guy gives so good it hurts. As for the music itself, Podington Bear is clearly influenced by William Orbit and the ambient side of Aphex Twin (which, I accept, are easy comparisons to make): he delights in soothing, textured sounds of a surprisingly high audio quality for home-spun MP3s. There’s a childlike quality about some of it that matches the hand-drawn bear logo: the synths often sound like they’re on factory presets, but if he lacks for innovative leads, he compensate with continually adventurous percussive rhythms. for the fact that it has vocals (by Jimmy Tamborello of The Postal Service); and his lone cover version, because it’s the one song we can all identify with.